Gen. 50:20 But as for you, ye thought EVIL against me; but God meant it unto GOOD, to bring to pass, as it is this day, to save much people alive. Joseph’s brothers evil intention was to kill Joseph (which wasn’t God’s intention) but conveniently a caravan passed by in the right moment and Joseph’s life was spared when he was SOLD as a slave and brought to Egypt – and thus being a blessing for Israel. Thus, ”ye thought EVIL against me; but God meant it unto GOOD”. Just because God allows man to sin, and on a few occasions even uses man’s evil schemes for something useful in the end – like punishing Israel physically by not preventing their enemies from attacking them – it doesn’t mean that everything under the sun happens for a reason. If that were the case, we’re making God out to be the author of sin. Allowing people to sin is not the same as endorsing evil. The truth is that each time a sin occurs, it always happens against God’s will with no exception. God has created us with free will, and this means that he normally doesn’t step in and prevents us from sinning (or else we wouldn’t have free will). I say ”normally” because I’m thinking of the global flood where God put an end to much wickedness by eliminating all people from the earth apart from Noah and his family.) If God would be the type who always prevented sin, his first measures would be to prevent Adam and Eve from eating of the forbidden fruit – something he never did. Neither did God prevent Joseph’s brothers from sinning, particularly not when God saw a way to let their ideas (even if they were wicked and against his will) be the means to use Joseph in a good way and save his people. God could naturally use other means, but he chose to make use of these particular events that Joseph’s brothers planned in their hearts. God certainly didn’t place any evil intentions in their hearts, because there is no darkness in God. Naturally it would be even better if the evil plans did not take place at all (it’s always better if people do NOT sin) but he is still able to respond to man’s actions and use them as he deems appropriate. If God knows that certain men plan X to occur, then naturally God can purpose to use it to his own advantage and even thwart their plans. This doesn’t mean that God always acts in this way. God decided to overrule the intended evil by Joseph’s brothers and rather use the events for something good (saving Israel) which was not intended by the brothers! It’s in this sense that we can read that the brothers meant it for evil, but God meant it for good. If God purposed a man like Joseph to end up in Egypt, why would he prevent his brothers from selling him to people who he knew would take him there? God doesn’t sin by purposing Joseph to end up in Egypt, and allowing his brothers to sin by selling him as a slave. God also knew the heart of Joseph and would naturally hear his prayers and help him out both where he was in the pit, where he screamed for help, and later on in Egypt. If, however, God would cause Joseph’s brothers to be jealous, hateful, selfish and end up being murderers and liars, God alone must also be blamed for their sin. It’s God’s prerogative to let a man like Joseph be subject to his brothers, but it’s all about allowing and not about causing/decreeing. It’s actually Judah (who would later on produce the Messiah in his blood line) who suggests that the brothers would not let Joseph die there in the pit where they had just thrown him, but that they would rather sell him for a price to the Ishmaelites. This idea actually saves Joseph’s life, but it certainly doesn’t pardon any of the evil actions committed by his brothers. God could easily have arranged circumstances, such as a caravan on route to Egypt to pass the area in the right time, knowing full well that the character of Joseph’s brothers would trigger them to act in the way they did. Selling Joseph rather than killing him would be a better solution for the brothers since they 1) did not have to get rid of Joseph by killing him, which is a serious step to take for most people, and 2) they would instead get money. The arrival of the caravan in that moment changed the whole story. Joseph would end up with much authority over the food supply in Egypt, resulting in that he would be able to spare his own people from the worldwide famine. If on the other hand God decreed and rendered certain the wicked intentions of the brothers as the means to bring about a good purpose, then again, God not only tempts people to sin but forces them to sin. When it comes to Joseph in Egypt and Jesus Christ being crucified, God has acted in a unique way to bring about a divine saving purpose for all humanity, but this doesn’t mean we should add to the Bible and suggest that God’s will always happens or that God wants people to sin so that he can bring about certain events. There is seldom a shortage of people who want to harm good people like Joseph Jacob’s son and Jesus Christ, so God certainly doesn’t need to cause anyone to do it. It’s sometimes enough to just remove a protecting hand from certain individuals, and their enemy might be able to hurt them. However, our prayers and our actions can naturally influence the outcome. Why else pray? Gen. 37:24 And they took him, and cast him into a pit: and the pit was empty, there was no water in it.25 And they sat down to eat bread: and they lifted up their eyes and looked, and, behold, a company of Ishmeelites came from Gilead with their camels bearing spicery and balm and myrrh, going to carry it down to Egypt.26 And Judah said unto his brethren, What profit is it if we slay our brother, and conceal his blood?27 Come, and let us sell him to the Ishmeelites, and let not our hand be upon him; for he is our brother and our flesh. And his brethren were content.28 Then there passed by Midianites merchantmen; and they drew and lifted up Joseph out of the pit, and sold Joseph to the Ishmeelites for twenty pieces of silver: and they brought Joseph into Egypt.29 And Reuben returned unto the pit; and, behold, Joseph was not in the pit; and he rent his clothes. Gen 50:15 And when Joseph’s brethren saw that their father was dead, they said, Joseph will peradventure hate us, and will certainly requite us all the EVIL which we did unto him.16 And they sent a messenger unto Joseph, saying, Thy father did command before he died, saying,17 So shall ye say unto Joseph, Forgive, I pray thee now, the trespass of thy brethren, and their sin; for they did unto thee evil: and now, we pray thee, forgive the trespass of the servants of the God of thy father. And Joseph wept when they spake unto him.18 And his brethren also went and fell down before his face; and they said, Behold, we be thy servants.19 And Joseph said unto them, Fear not: for am I in the place of God?20 But as for you, ye thought EVIL against me; but God meant it unto good, to bring to pass, as it is this day, to save much people alive.21 Now therefore fear ye not: I will nourish you, and your little ones. And he comforted them, and spake kindly unto them. The brothers wanted to ask for forgiveness, and Joseph did not correct them and say that they had not sinned. However, he did inform them that something good came out of the whole story – something that their brothers did not intended or had in mind. They initially intended to kill Joseph but ended up selling him. We can also read about Joseph’s fate in The book of Jasher (or The book of the just which is a translation from the Hebrew sēfer ha yāšār). This book is mentioned in 2 Sam. 1:8 and Joshua 10:13, as well as quoted by Paul in 2 Tim. 3:8 . This ”lost book” is best viewed as secular Jewish history rather than necessarily being divinely inspired by God, but also secular history might contain the truth. (There is at least one falsification of The book of Jasher, so don’t read the version from 1750.) This book sometimes reveals lots of extra details of Biblical events, and despite these details they line up perfectly well with the Bible and sometimes even provides extra light. Nevertheless, if we would end up with contradictions the Bible is the source to trust since we know that the content is inspired by God and accurate. According to The book of Jasher, it was Simeon who brought forth the idea to have Joseph killed, and it was Judah who suggested that Joseph should rather be sold (and thus saved his life). 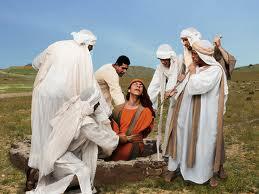 In the meantime, God heard Joseph’s anguish in the pit, and saved him from being killed by scorpions and snakes. In both the Bible and The book of Jasher, Reuben seems to be one of the most innocent of the brothers. However, apparently he went along with the lies afterwards, and never told their father what really happened to Joseph. Jasher 41:9 And Joseph was seventeen years old, and he was still magnifying himself above his brethren, and thought of raising himself above them.—21 And Jacob sent his son Joseph to the valley of Hebron, and Joseph came for his brothers to Shechem, and could not find them, and Joseph went about the field which was near Shechem, to see where his brothers had turned, and he missed his road in the wilderness, and knew not which way he should go.—25 And Simeon said to his brethren, Behold the man of dreams is coming unto us this day, and now therefore come and let us kill him and cast him in one of the pits that are in the wilderness, and when his father shall seek him from us, we will say an evil beast has devoured him.—28 And they took him and cast him into a pit, and in the pit there was no water, but serpents and scorpions. And Joseph was afraid of the serpents and scorpions that were in the pit. And Joseph cried out with a loud voice, and the Lord hid the serpents and scorpions in the sides of the pit, and they did no harm unto Joseph. Below we can read that the Lord was pleased to have Joseph sold, because he didn’t want Joseph to be killed as his brothers intended. This means that the arrangement that the brothers had in mind (killing Joseph), was overturned when the caravans passed by and Judah proposed to have Joseph sold. Jasher 42:1 And they went and sat on the opposite side, about the distance of a bow-shot, andthey sat there to eat bread, and whilst they were eating, they held counsel together what was to be done with him, whether to slay him or to bring him back to his father. 2 They were holding the counsel, when they lifted up their eyes, and saw, and behold there was a company of Ishmaelites coming at a distance by the road of Gilead, going down to Egypt.3 And Judah said unto them, What gain will it be to us if we slay our brother? peradventure God will require him from us; this then is the counsel proposed concerning him, which you shall do unto him: Behold this company of Ishmaelites going down to Egypt, 4 Now therefore, come let us dispose of him to them, and let not our hand be upon him, and they will lead him along with them, and he will be lost amongst the people of the land, and we will not put him to death with our own hands. And the proposal pleased his brethren and they did according to the word of Judah. 5 And whilst they were discoursing about this matter, and before the company of Ishmaelites had come up to them, seven trading men of Midian passed by them, and as they passed they were thirsty, and they lifted up their eyes and saw the pit in which Joseph was immured, and they looked, and behold every species of bird was upon him. 6 And these Midianites ran to the pit to drink water, for they thought that it contained water, and on coming before the pit they heard the voice of Joseph crying and weeping in the pit, and they looked down into the pit, and they saw and behold there was a youth of comely appearance and well favored. 7 And they called unto him and said, Who art thou and who brought thee hither, and who placed thee in this pit, in the wilderness? and they all assisted to raise up Joseph and they drew him out, and brought him up from the pit, and took him and went away on their journey and passed by his brethren. 8 And these said unto them, Why do you do this, to take our servant from us and to go away? surely we placed this youth in the pit because he rebelled against us, and you come and bring him up and lead him away; now then give us back our servant. 9 And the Midianites answered and said unto the sons of Jacob, Is this your servant, or does this man attend you? peradventure you are all his servants, for he is more comely and well favored than any of you, and why do you all speak falsely unto us? 10 Now therefore we will not listen to your words, nor attend to you, for we found the youth in the pit in the wilderness, and we took him; we will therefore go on. 11 And all the sons of Jacob approached them and rose up to them and said unto them, Give us back our servant, and why will you all die by the edge of the sword? And the Midianites cried out against them, and they drew their swords, and approached to fight with the sons of Jacob. — 17 Surely you have said that the young man is your servant, and that he rebelled against you, and therefore you placed him in the pit; what then will you do with a servant who rebels against his master? Now therefore sell him unto us, and we will give you all that you require for him; and THE LORD WAS PLEASED TO DO THIS IN ORDER THAT THE SONS OF JACOB SHOULD NOT SLAY THEIR BROTHER. 18 And the Midianites saw that Joseph was of a comely appearance and well-favored; they desired him in their hearts and were urgent to purchase him from his brethren. 19 And the sons of Jacob hearkened to the Midianites and they sold their brother Joseph to them for twenty pieces of silver, and Reuben their brother was not with them, and the Midianites took Joseph and continued their journey to Gilead. 20 They were going along the road, and the Midianites repented of what they had done, in having purchased the young man, and one said to the other, What is this thing that we have done, in taking this youth from the Hebrews, who is of comely appearance and well favored. Jasher 42: 23 And whilst they were thus discoursing together, they looked, and behold the company of Ishmaelites which was coming at first, and which the sons of Jacob saw, was advancing toward the Midianites, and the Midianites said to each other,Come let us sell this youth to the company of Ishmaelites who are coming toward us, and we will take for him the little that we gave for him, and we will be delivered from his evil. 24 And they did so, and they reached the Ishmaelites, and the Midianites sold Joseph to the Ishmaelites for twenty pieces of silver which they had given for him to his brethren. 25 And the Midianites went on their road to Gilead, and the Ishmaelites took Joseph and they let him ride upon one of the camels, and they were leading him to Egypt.